Disneyland is epic! It was the first of the Disney theme parks. It opened in the 1950's and has grown through the years with attractions such as It's a small world, Space Mountain and an entirely new theme park known as California Adventure which now stands on the site of the old Disneyland parking lot. 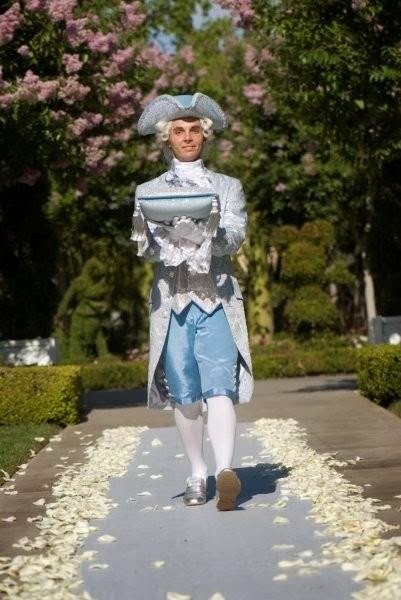 Disney has fluctuated through the years between allowing weddings inside the park. Sometimes they allow small ones near the Magic Castle, sometimes they hold larger events after the park has closed. You really have to check with Disneyland to see if they hold weddings in the park because this option seems to change quite a bit. 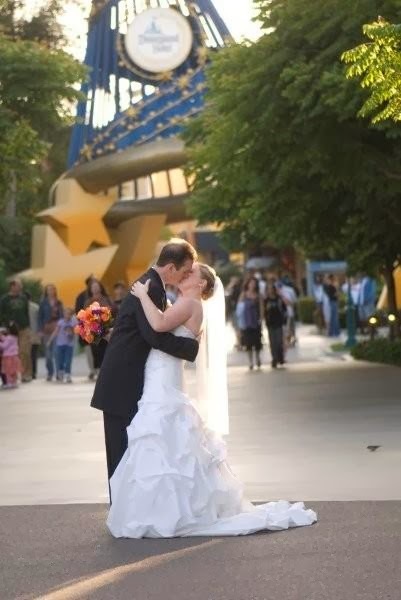 Most weddings occur outside the park, yet still inside what is now termed "The Disneyland Resort." The Resort consists of three hotels, The Disneyland Hotel, The Grand Californian, and the Paradise Pier Hotel. The Disneyland hotel was the original hotel that is about as old as the park, yet had only been acquired by Disney in the past few decades. The Grand Californian was built around the same time as Disney's California Adventure in the late 1990's. It features the architectural style of Northern California, If you haven't heard of the Paradise Pier Hotel, it's fairly new, fairly small, and basically just offers rooms (no grand ballroom). The most common places for weddings are The Disneyland Hotel and The Grand Californian. The Grand Californian features good size ballrooms, a nice lobby, and a fairly small outdoor venue to get married. The Disneyland Hotel, on the other hand, is a larger property and connects with another prominent Disney feature, Downtown Disney. The big selling point is The Rose Garden. The Rose Garden is the type of place you would imagine Disney would have designed for a wedding. It features a large gazebo on one end and a center isle that runs 150 feet. It is surrounded by tall hedges that help cut down on the looky-loo gawking tourists. 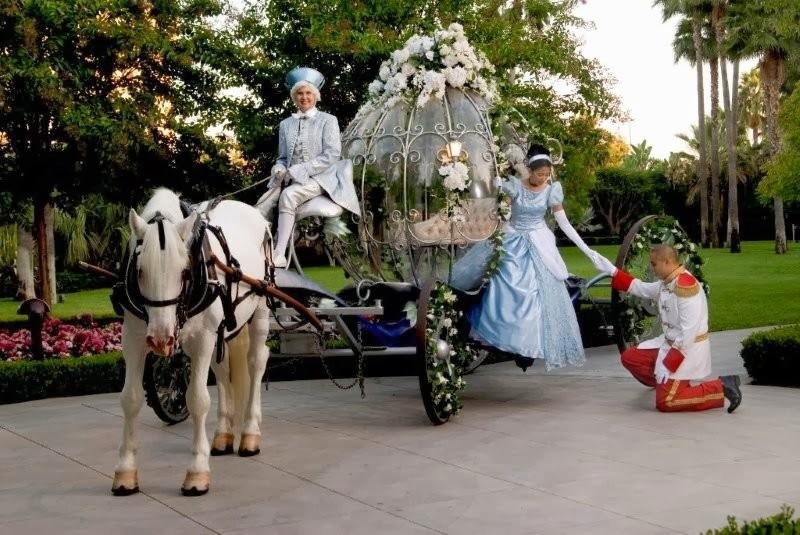 At the entry point, for a fairly significant financial investment, you can have the Cinderella Carriage drop off the bride for your epic bridal grand entrance! If you may be somewhat disappointed to learn that you can't get married in the park, believe me, you won't be unhappy with this option. Since it's next to Downtown Disney there are a lot more options for photographic possibilities. The Grand Californian is set up in a gold rush era theme. It comes off looking and feeling like a Sierra Nevada lodge. Thus the interior has a lot of brown and bright lights shining to offset the dark walls. It's not gloomy but just the same it's kinda dark. The outdoor location for weddings isn't as exciting as the Rose Garden. It's smaller and more compact, off to the side of the hotel. It's as nice if not nicer than what most hotels offer, but it's not on par with the Rose Garden. 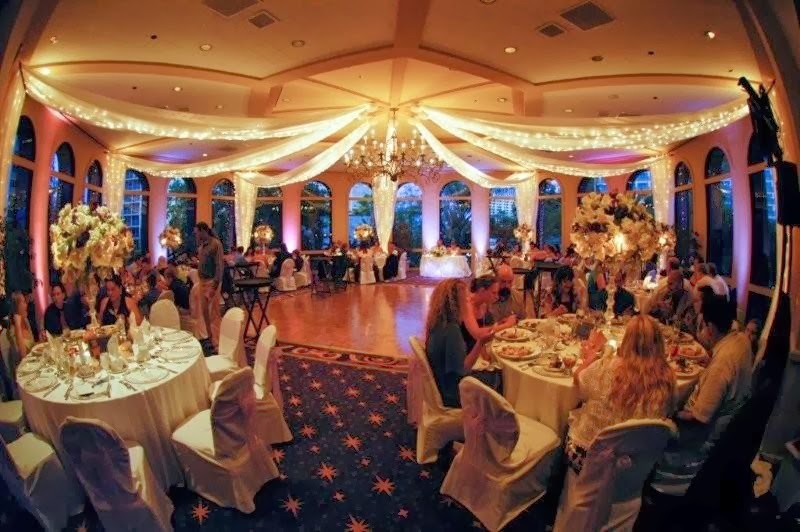 The ballrooms are as nice if not nicer than anything you will find at the Disneyland Hotel. There seems to be a bit more options at the Grand Californian for nice banquet rooms. Two things I can assure you about Disney. First, everything they do is perfect. I mean it. If you want streamers to fall from the ceiling during your first dance at exactly two minutes and 19 seconds into the song if they can make it happen it will happen exactly at that time. The Disney Resorts have a level of service that we’ve seen exceed some of the best five-star resorts. Having known people who work for Disney they have told me that if something was supposed to happen at 4:00 PM this really means it’s supposed to be ready to happen at 3:55 PM with five minutes for down time. The second thing I can tell you about Disney is that they charge for everything. This isn’t a bad thing. There are many more places that will throw in many things for free, but their level of service isn’t up to Disney. It’s like the old saying, service, price, quality, select two. I am constantly impressed with how well Disney runs weddings. What Type Of Bridal Couple Would Like This Place? A Disney wedding makes perfect sense if you’re a Disney fan. If you love Disneyland, and all the characters you will, of course, love the Disneyland hotel. You can have Mickey and Minnie show up to your wedding and dance, at a price. So, what if you like Disney but aren’t a huge fan, and may be concerned that a Disney wedding is, pardon the pun, goofy? There are some people who may feel that a Disney Wedding may be too immature for their tastes. For these people, I suggest checking out the Grand Californian. It doesn't have the look and feel of a Disney storybook. If you are on the fence and need a good reason to go one direction or another, here’s the point, forget the characters and the name Disney for a moment, it’s simply a great place to have a wedding. Overall, if you want your wedding done to perfection, check out the Disney Resorts! And yet, if you can't bring yourself to having the word "Disneyland" on your wedding invitation or you have limited funds that need to be stretched further then there are many other great places to investigate, look on the side for other venue reviews. The ceremony is in the Rose Garden which is an ideal outdoor location for a wedding. It’s an ideal location for a garden wedding and probably one of the nicest garden areas in Southern California. Like many locations we’ve featured, it has a gazebo. What’s different about this gazebo is that it’s huge! You can fit all your guests under it if it rains (don't ask us how we know!) . What also makes it nice for photography is that there are back entrances to the Gazebo, thus the photographer can move in and out of shots without having to walk in front of the guests. The rose garden, as the name suggests does have a fairly good assortment of rose bushes. They have various colors that we sometimes use to accent the background of portraits. There are also two other gazebos within walking distance of the Rose Garden. A feature that many brides seem to opt for is the horse and carriage. It’s very impressive to see. One of our brides who decided not to get the horse and carriage thought that the horses would scare the guests. The horses don’t get anywhere near the guests. Though this an expensive option, it comes of looking very impressive! The Marina Room is most often used for smaller weddings. It’s a hexagon shaped room with floor to ceiling windows. It sparkles for a first dance when there still is daylight behind coming through the windows. It's a room that holds around 150 comfortably. There is another larger ball room without window lights, The Grand Ballroom. This is the room to get when you want to throw the massive wedding and invite everybody you know! This room is similar to the Grand Ballrooms at The Grand Californian. Once you're inside these large ballrooms the interiors are similar. The Grand Californian offers more opulent hallways. The service is great, the food is great, the staff is friendly, and after doing hundreds of thousands of weddings, they figured out most of their problems and can work around them. One thing that is very important to the staff is that brides don't see other brides. Thus certain areas may not be open to photography during certain times. Another thing is that parking can be fairly expensive. They often have a more reasonable event rate for weddings, however, but the point remains that unless you get parking in your package your guests will have to pay to come to your wedding reception. My view of Disneyland is more than a cultural icon or a theme park backed by a large world conglomerate. I view Disneyland as a place was built to inspire the imagination of children. It Foster's creativity, imagination, and promotes happiness. It's the one place that your parents may have visited when they were kids with the same wide-eyed awe you had the first time you saw it. It doesn't matter if you've been there 50,000 times, when your children see it for the first time and you can see the expression on their face, and see the happiness it igives them, it will be like stepping into the park for the first time. Inspiring a child's imagination has so many benefits, you never where it will go. An 11-year-old boy who was one of the first to enter the park back in 1955 known as George Lucas later went on to create the epic movie series known as Star Wars (now under the Disney umbrella) Disneyland represents so much, American innovation, imagination, and best of all, happiness. How could you not have a blissful life once you get married at the happiest place on earth? As I mentioned before this isn't a wedding venue for everybody. If you are a Disney fan and your dream is to have a wedding here, yes it's worth going into debt for because you will never have a chance to do it again Most of the brides I've worked with at the Disneyland Resorts weren't huge Disney fans. Only a couple rented Mickey and Minnie Mouse. There are key dates that get booked up rather quickly so you may need to move on securing your date if it is available. If you can be flexible on your date you may have an easier time securing this venue. The larger rooms on key summer date most likely book first, but then again they can host many, many weddings a day at the resort. Get a good photographer, you'll appreciate it in the end. Are you planning a destination wedding at Disneyland? Many of our clients we've photographed at the Disneyland Resort have been from either out of the state or out of the country. We've made it so easy for them to work with us. With the help of the internet, you don't have to worry that you don't live close by to us. Lifetime Images has been around for over a dozen years and will be around for years to come. We are insured, and dependable. If you're planning a wedding from a distance you don't have time to deal with people who aren't reliable. Best of all, we have a lot of friends in the business who are also reliable and thus we can help assist you in finding the right vendors. We realize that people who read these reviews may be people who are merely fans of Disneyland. Perhaps you are already married and live in another part of the world and wonder what it's like to have a wedding at Disneyland. We're going to to do a better job filling you in with the details. There is something that is really good and wholesome about Disneyland that draws people in. I've known people who have worked for the park in various capacities over the years and without a doubt, they speak highly of the place and fondly of their time spent at the park. In my own life, I've watched my kids grow up living close to the park and going a lot. As they get older they never have outgrown Disney. We have so much good stuff to share with you. Please keep checking back on this site.